Did you read the Ancient Greek tragedy Antigone, by Sophocles, in school? I was actually in a college production — performed in Greek. It was much too hard for me, even with my bit part. But in high school, the play really captured my imagination with its young heroine insisting that the higher laws required her to give her rebel brother a proper burial and the king determined to make an example of rebels. Anyway, that’s how I remember dinner discussions — my aunt and uncle arguing for the power of the state and me arguing for rebels. So you may imagine how intrigued I was when I saw that a theater troop was enlisting big stars to bring Antigone (in English) to Ferguson, Missouri, to generate a community dialogue. Ferguson was where the majority of Americans first became aware of the issues that have led to the Black Lives Matter movement. National Public Radio alerted listeners to the event, here. “WILLIS RYDER ARNOLD (REPORTER): Bryan Doerries is a director who puts on ancient Greek plays. He says his productions aren’t boring classroom exercises. “BRYAN DOERRIES: These are readings on steroids, and spit is flying and tears are projectile crying off the stage, and sounds are coming up out of the actors that they’ve never heard themselves make before. “ARNOLD: After the performance, Doerries asks the audience to react. He leads a conversation that can take as long as the actual play. For him, the performance is a chance to ask some deeper questions. “DOERRIES: How many different ways can we give you, as the audience, permission to have a conversation that wouldn’t otherwise be possible, to speak your personal truths, to be acknowledged and heard? “Screening of selected segments from the documentary Antigone in Ferguson, followed by a dramatic reading of scenes from Antigone with Reg E. Cathey (House of Cards, The Wire), Gloria Reuben (ER), Glenn Davis (24, The Unit), and Samira Wiley (Orange Is the New Black). TheCenterforSE ‏@TheCenterforSE Sep 18 Amazing! #AntigoneinFerguson brought the community together through art and our own human experiences! Carrie Z ‏@velo_city Sep 18 All of tonight’s #AntigoneinFerguson was incredible. Thank you @TheaterofWar@TheCenterforSE. Wow. 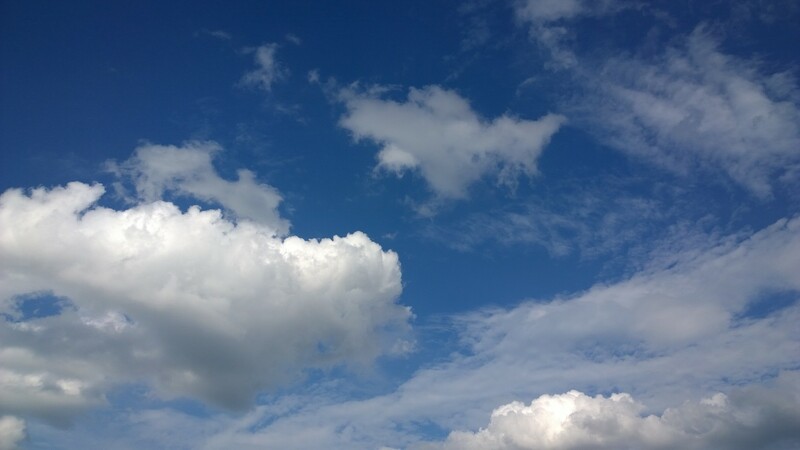 So much anxiety about “the others” these days, anxiety that is seldom based on knowing even one of those others! That is why I found this story by Steve Annear in the Boston Globe so charming and important. He wrote, “Mona Haydar knew that when she set up two signs outside a Cambridge library [in December] with the words ”Ask a Muslim’ and ‘Talk to a Muslim,’ she had to be prepared for strong opinions about her faith. 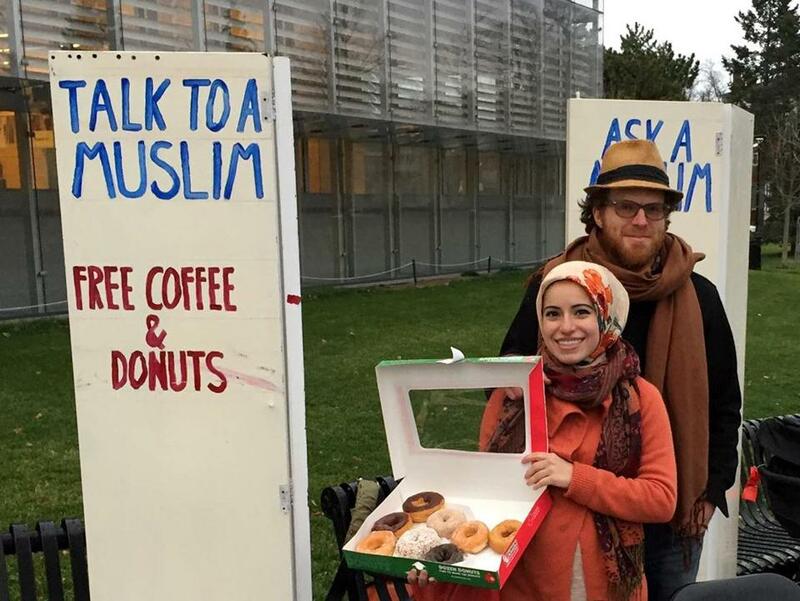 “Holding a box of doughnuts and cartons of coffee from Dunkin’ Donuts, and wearing a traditional hijab, Haydar last Friday and Saturday planted herself alongside her husband, Sebastian Robins, outside the library for several hours each day. “Haydar said that over the two days they spoke with more than 100 strangers. The initiative, she said, was inspired by a similar act, called Talk to an Iraqi, that was featured on ‘This American Life’ in 2008.” More here. I’d say she gave a gift to the Cambridge populace, which although considered open-minded, is not monolithic. And she seems to have received a gift in return: the satisfaction of initiating an important conversation and of confirming that the majority of people are kind. Mona Haydar and her husband, Sebastian Robins, stood outside of a library in Cambridge. Sometimes it’s hard to remember the details of what I did last week, or even today. If it’s a question of work, I can review my calendar, the e-mails I sent, or see what I checked off my checklist. But the things that seem important and keep popping up in my head are shreds of conversations the details of which I can’t always remember. Who said that to me? And where? Was it in the hallway, the ladies room, the cafeteria, walking into the building, waiting to go through the security line? Was it someone I see a lot? A stranger at a food truck? My new project is to do a better job of holding on to these brief but significant interactions. Coming into the building with my lunch, I met another woman coming out. We hadn’t seen each other for weeks and stopped to chat. I admired her earrings. She said they were from the Rhode Island School of Design and told me her son just started grad school there. We talked about the wonderful craft sales RISD has, and I said I especially like the one where they block off several streets sometime around Mother’s Day. Going home on the train, I sat next to a co-worker who had been strung out with anxiety about her only child, six months old, who had a fierce case of croup that got her hospitalized for a whole weekend. My colleague thought the baby was starting to pull out of it. As she talked about how cheerful the little girl is and how much she loves to carry her in the baby carrier next to her chest, the subway car seemed to fill with love and lift toward the heavens. An experimental theater piece to test the Theory of Purposefully Divided Attention to Fend Off Meltdowns. G: Why is your hairdresser your hero? 1: She’s a real bootstrap entrepreneur. She’ll try anything. G: Is that a blackberry in your popsicle? 2: Well, when you have kids, you can’t participate in every charity event or random partnership. 3: You have to prioritize, be strategic. Know when to say no. 1: But she has a great community reputation. She’s so upbeat. G: I really think that’s a blackberry. Like Mrs. Rabbit’s in Peter Rabbit. Supporting everything in the community can add up. 3: But you can waste a lot of time. G: People are grateful, though. If you’re strategic, you miss the kind of opportunities that you have no idea where they will lead. 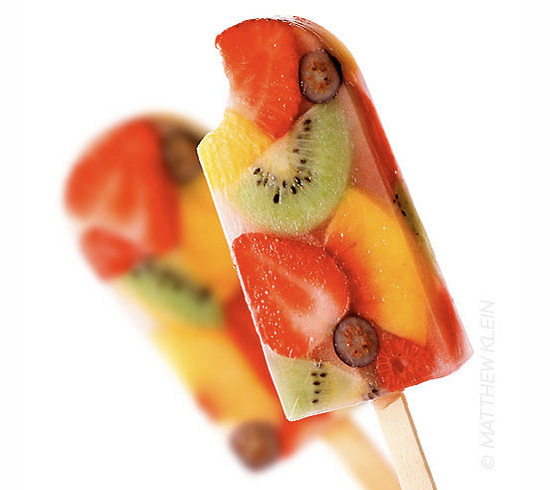 I like the way that popsicle drips right into the holder. It’s less messy. Small: Do you want one? G: I don’t want to take your last popsicle. Small: We can make more. G: Careful — the juice is spilling. One and one and 50 make a million. It’s good to be open to serendipity if you possibly can. 2: There are only so many hours in the day. 3: Numerous small investments can’t get what one big investment would. G: Do you want a napkin? Small: I got a green popsicle at Whole Foods, but it dripped all over my dragon shirt. It was green. G: There is nothing like a reputation for being upbeat and cooperative. I know where we can pick blackberries for the next batch of popsicles. Small: But you have to add juice so it sticks together. 1: We now trade services. She does that with almost everyone. I feel like she could teach a class in entrepreneurship. G: Teach one together, how about? Small: Do you want a popsicle? Do you want one now? G: Maybe after dinner. Look, that’s a raspberry. Or do you think it’s a strawberry? Small: Do you want a popsicle now? I can go get it. We can make more later. Yes or no?